Joboshare Video to Audio Converter is a powerful tool to extract audio from video files to MP3, WAV, WMA and OGG files. The converted audio files can be played on different audio players such as iPod Shuffle, iPod Nano, iPod, Zune and so on. 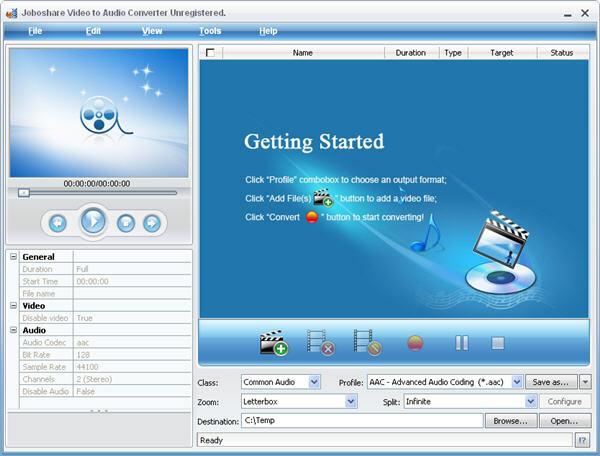 Joboshare Video to Audio Converter can extract the audio tracks from video files and then convert the extracted audio tracks to the format as you like, provides various options to adjust the audio quality. Joboshare Video to Audio Converter lets you set various audio encoding options such as bit rate, audio channel, and sample rate and so on to adjust the output audio quality. Joboshare Video to Audio Converter is super fast and very easy to use. Even beginners can convert video to MP3, WAV, WMA and M4A with this software without any learning curve. All conversion processes in the video to audio converter, such as convert AVI to MP3, convert WMV to MP3, are very easy and fast. Support all popular audio formats including MP3, WAV, AC3, WMA, M4A, OGG, AAC etc. Support all popular video formats including MPEG1, MPEG2, MPEG4, WMV, AVI, MP4, 3GPP, 3G2, MOV, RM, RMVB, OGG, DV, H.264/AVC and so on. Allow you to adjust audio bit rate, audio channel, sample rate and let you select an audio encoder. Convert video files to MP3, WAV, WMA and OGG. xtract audio tracks from your favorite movies(RM, AVI, MOV,MPEG...). Extract the audio of video files to the popular audio formats. Qweas is providing links to Joboshare Video to Audio Converter 2.9.8.0620 as a courtesy, and makes no representations regarding Joboshare Video to Audio Converter or any other applications or any information related thereto. Any questions, complaints or claims regarding this application Joboshare Video to Audio Converter 2.9.8.0620 must be directed to the appropriate software vendor. You may click the publisher link of Joboshare Video to Audio Converter on the top of this page to get more details about the vendor.